Lodged between New Mexico and California, Arizona lies between mountains and deserts. For example, if you happen to climb up the San Francisco Peaks around Williams, you would be surprised to encounter vast coniferous forests and lush altitude vegetation... while the desert is only a few miles away! In winter, it snows on the Grand Canyon and the highlands around it; in the summertime, nights can be cool and chilly while days remain extremely hot. 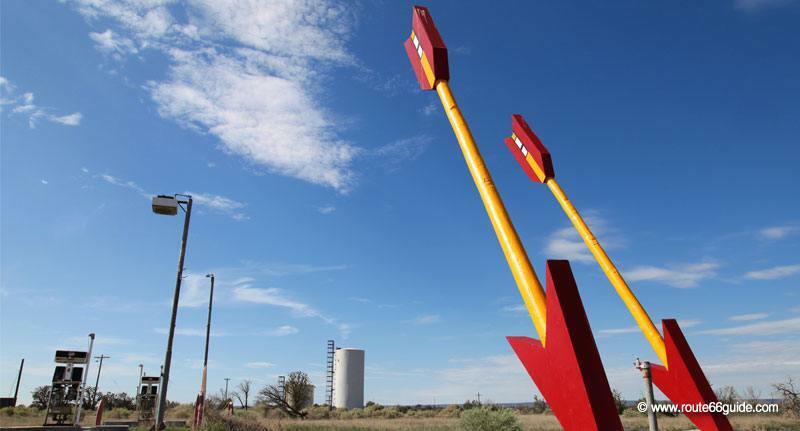 Above: The restored giant arrows, forever indicating the former Twin Arrows resort, now in utter decay in the heart of the desert, stand on a stretch of Route 66 overgrown with vegetation and closed to all traffic, pedestrian included. Regardless, entering Arizona from New Mexico through Lupton, the first state settlement crossed by Route 66, you will be primarily greeted by desert landscape. Arizona presents the most extreme climates of the historic route. Scarce water, hard to find around here, explains the numerous pickup trucks on the road carrying huge, plastic water tanks. 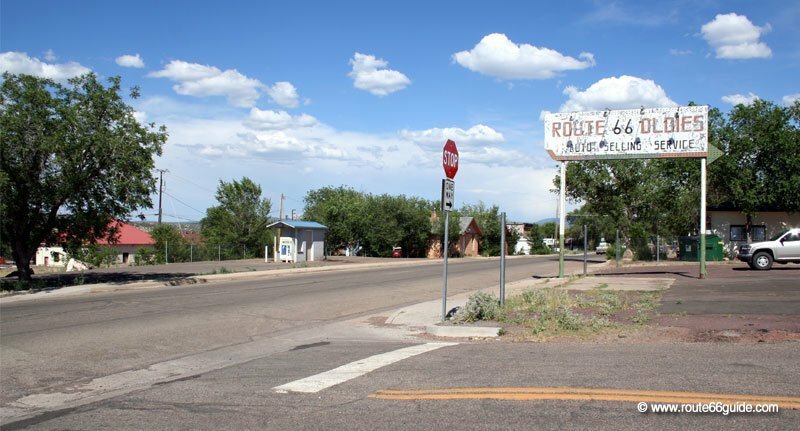 In 1984, the small town of Williams in Arizona's highlands, was the latest locality crossed by the official "Route 66" before it was completely decommissioned. 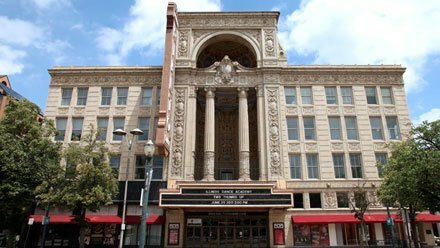 Its pretty historic center remains lively and animated throughout the high season, its atmosphere ranging from western to retro 1950's. 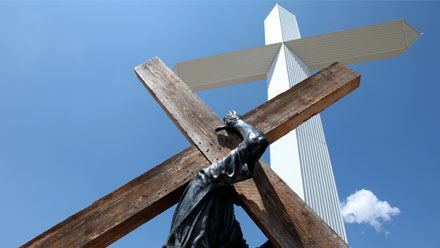 On the other hand, Williams is one of the main gateways to the Grand Canyon and the starting point for the tourist train leading thousands of visitors into the Park. Its main streets are lined with hotel chains that regularly display the NO VACANCY sign in high season. 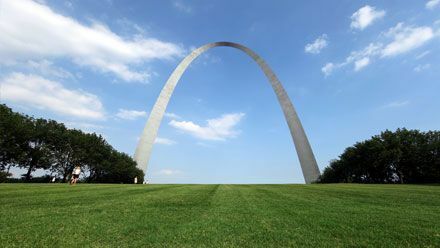 Route 66 runs through the center of the locality, with its gas stations, diners, saloons, gift shops and small museums. 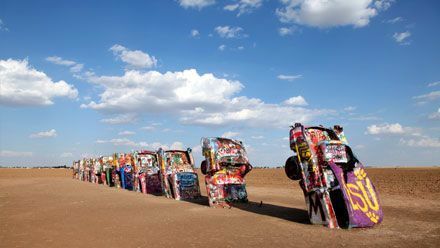 Arizona holds the longest, entirely passable stretch of Route 66. These original and remarkably well preserved 159 miles start from Ash Fork (Exit 139) and run through Seligman and Peach Springs to finally reach Kingman. Canyon De Chelly National Monument in Chambers, holds the ruins of about sixty Pueblo Indian villages deep down in two canyons. The Painted Desert, north of Petrified Forest National Park, features layers of eroded rocks, stained with iron, manganese and other minerals. It is adorned with a thousand colors, as if painted by a human artist, and emphasized at sunrise and sunset. The WigWam Motel in Holbrook, iconic establishment of Route 66, erects its hard-fabric teepees on the transcontinental route since 1940. 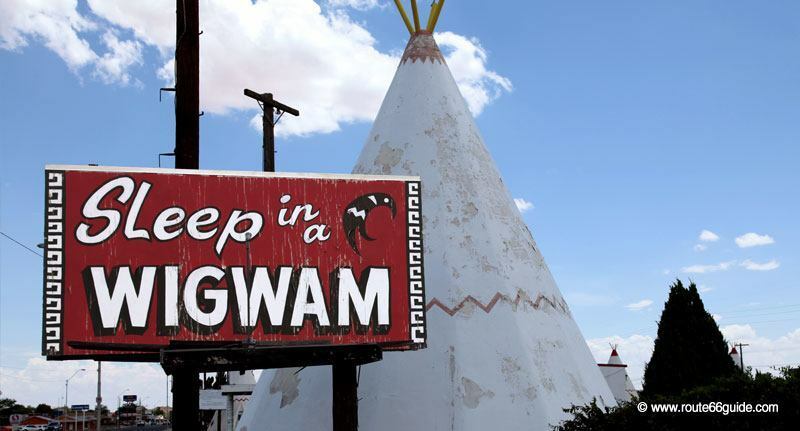 At that time, this WigWam was part of a chain of seven identical establishments scattered along Route 66 between 1930 and 1950. Today, only two of them, largely untouched, remain in service (the second one lies in California). 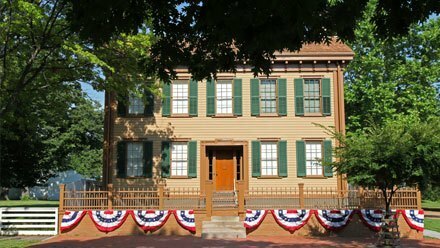 That of Holbrook is of particular interests, as it has been run by the same family since the 1950s. We love the decidedly retro atmosphere, stressed even further by the old cars parked by each teepee. Above: The Wigwam Motel in Holbrook and its emblematic teepees, a sure item on all golden era postcards. Jackrabbit Trading Post near Joseph City, was also one of the "road-marketing" pioneers, which began to flourish in the 1930s along Route 66. In 1949, its yellow billboards and giant rabbit proclaiming "Here it is! " could be found all along Route 66. The last of them rests impassively planted in the wilderness, across the souvenir shop famous for its legendary homemade "cherry cider" (a great gift idea). 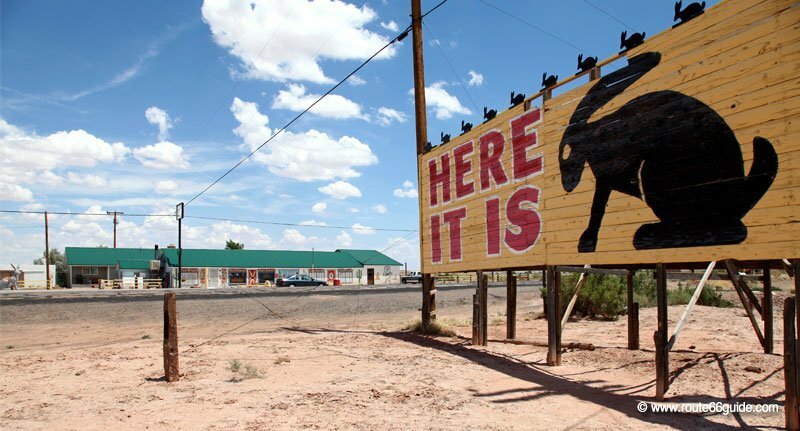 Above: "Here it is" proclaims the giant sign of Jackrabbit Trading Post gift shop. 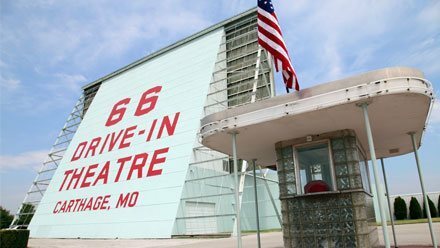 It is located a few meters from the building, on the other side of Route 66. Meteor Crater in Meteor City bears the scars of the brutal impact of a meteorite, crashing down in the middle of the desert nearly 50,000 years ago. On impact, it dug a 570 ft. deep and 4000 ft. wide chasm. Above: The gaping hole, caused by the fall of a meteorite 49,000 years ago, stretches 1-km wide in Meteor City. The crater has been fitted with observation platforms (not continuously secured, watch out for the little ones) and a small exhibition describes this amazing natural disaster. Grand Canyon National Park is not located directly near the historic route but a few miles from Flagstaff and Williams. These two localities, right on the edge of Route 66 are the main gateways to the mythical Grand Canyon. The offer restaurants, hotels and shops and tourist services. Remember to book your room in advance if you plan to visit the Grand Canyon during major holidays or on weekends and / or holidays. Above: Grand Canyon National Park, Arizona. Among other things, Williams is famous for being crossed by the latest Route 66 segment in service back in 1984. This tourist town now lives off of tourism, especially thanks to its proximity to the Grand Canyon, which is easily reachable on a nice tourist train. 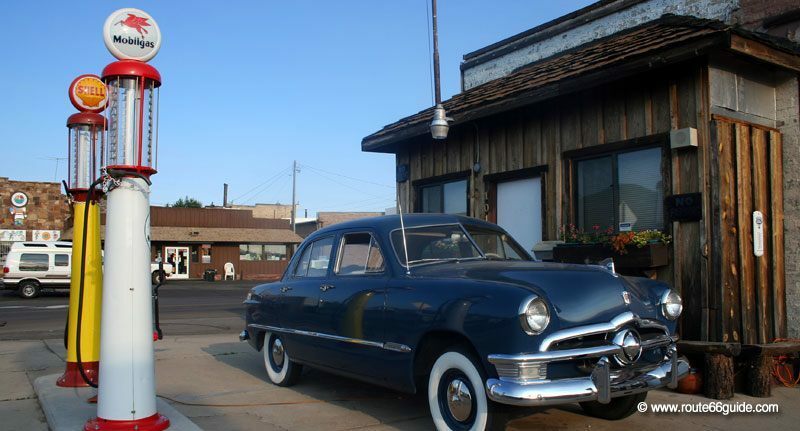 Its downtown atmosphere lies somewhere in between "saloon" and retro fifties style. 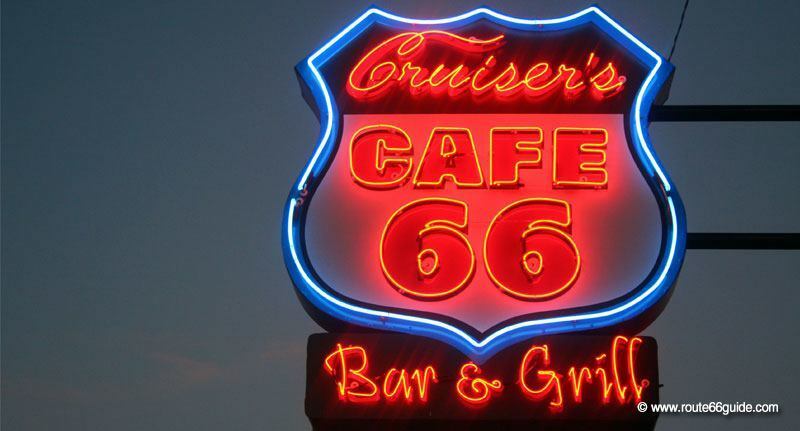 Above: Cruiser's Cafe 66 in Williams, Arizona. The longest continuous segment of the original Route 66 stretches around the tiny town of Ash Fork ( Interstate exit "Crookton Rd", between Ash Fork and Seligman) and takes you non-stop until the California border! Above: Route 66 in Ash Fork, Arizona. The "Snow Cap Drive In" in Seligman is an unconventional family diner. Here, the late Juan Delgadillo brought a smile to his guests' faces, with great fanfare magic, jokes and various tricks of legerdemain under a truly amazing - and hard to miss - construction, both the outside and inside. Juan's children and wife perpetuate the tradition of "dinner and show" in Snow Cap-style around some of the best "red chiliburgers" and tacos in the area. The "66 Town Signs", a group of road signs for each of the places mentioned in the song by Nat King Cole "(Get your Kicks on) Route 66", can be found in Truxton, at the foot of an old 1950s Ford. Above: The Sitgreaves Pass in Arizona. Oatman is a former mining town, restored as a nice little tourist town, uniquely distinguished by the presence of "burros" or "wild donkeys" wandering freely in the locality. 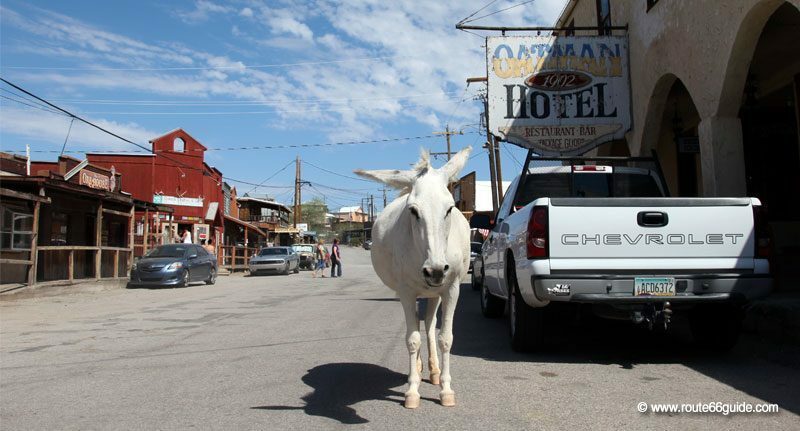 This is where Clark Gable spent his wedding night, staying at "Oatman Hotel & Cafe" for the occasion. Above: Historic Route 66 in Oatman, Arizona. Arizona was home to the last segment of Route 66 service, passing through Williams as late as 1985. 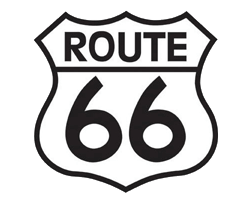 The state still holds the largest, entirely passable segment of Route 66 (159 miles from Seligman to Kingman). 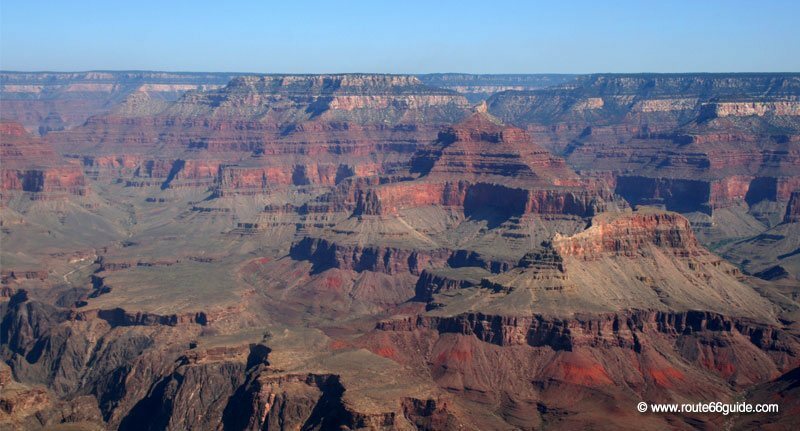 Arizona is known worldwide for the unrivalled geological fault running across its northwest, the one and only Grand Canyon, a few miles away from Route 66. North-western Arizona holds one of the most spectacular geological phenomena in the world, the Grand Canyon, with its ocher, gold and fire rocks, carved by the Colorado River. 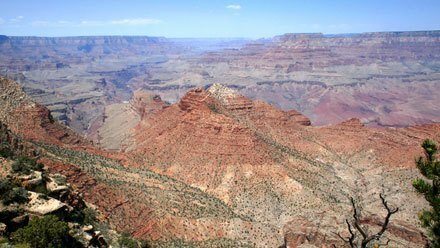 Stretching 227 miles from Lake Powell to Lake Mead, the Grand Canyon can reach a depth of 6,000 ft. and a width of 18 miles. 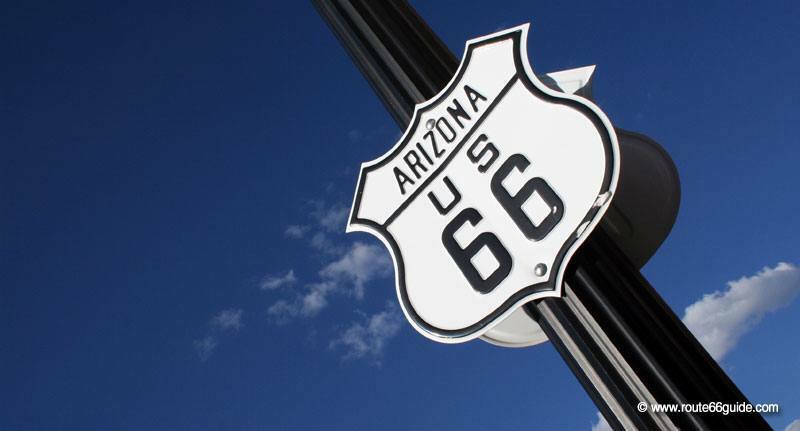 Each year, it attracts over four million visitors who unknowingly and quite often ride a small section of "Historic Route 66" by entering Williams or Flagstaff, the two main gateways to the National Park, which lies slightly removed from Route 66. Above: Grand Canyon National park in Arizona. Since 1919, a large area of ​​nearly 1,904 sq. miles is classified national park. In 1979, the Grand Canyon became part of UNESCO's World Heritage. Of particular interest are the "Petrified Forest" National Park and the "Painted Desert" within, whose rocks in supernatural shades seem to be the work of men. Dusk or dawn offers the most spectacular views. Both parks are located east of the town of Holbrook. 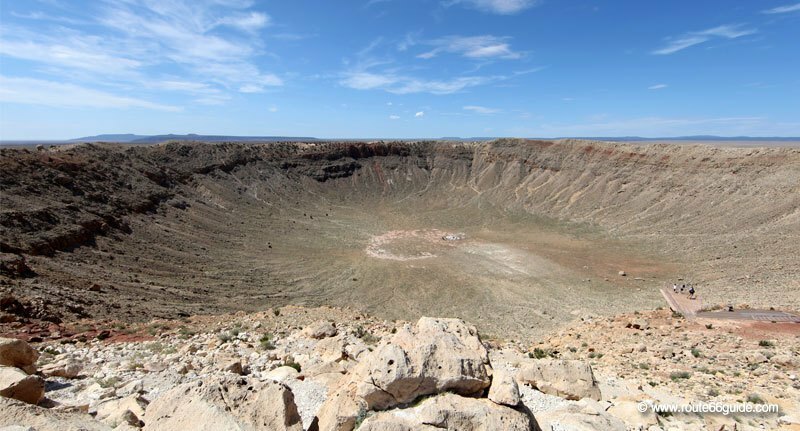 Around Meteor City, the Meteor Crater is another geological feature that stretches its amazing gaping hole in the hollow of the desert. 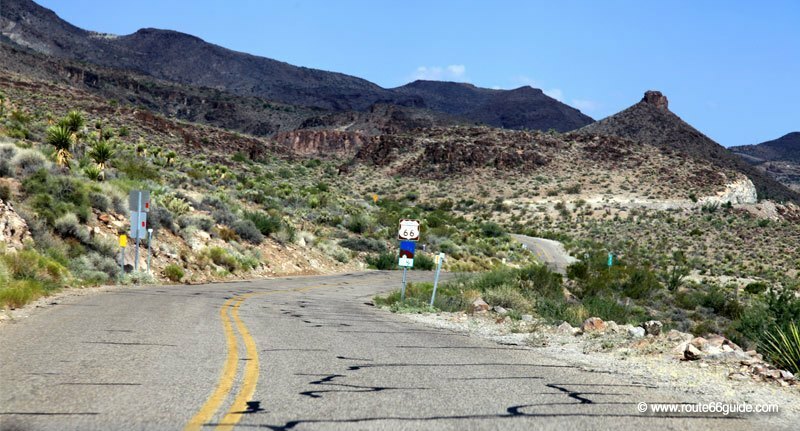 The famous "Oatman Highway" is an old section of Route 66 climbing the Black Mountains up to Oatman. 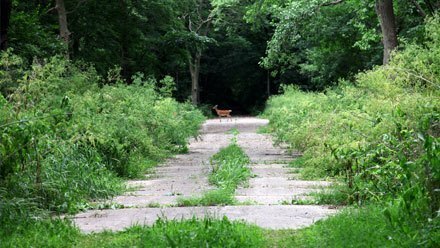 Enjoy breathtaking views from this downright hilly section, a real challenge for drivers and vehicle brakes. Drive with caution, control downhill speed and never park on the road or nearby. In the desert, beware of flooding (!). Even if the rains are rare, the road can be underwater in no time, Avoid driving in water, unless equipped with a suitable vehicle.